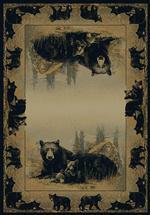 The Time to Play Area Rug is a very popular member of the Hautman Style Line, and is rich with soft vintage colors and features a beautiful black bear sow and a pair of tired cubs. Bordered by a scene of playful cubs, the central image of mother and cubs completes the sweet story. This marvelous rug is available in a range of sizes for just about any size room you can imagine. The time to play area rugs offer up a sweet and charming image in superb natural colors all in a plush bounce-back resilient quality rug. The beloved bear images are both whimsical and skillfully executed in true to life colors designed to compliment a wide range of rustic color themes. While a product of machine weaving, this well made rug is composed of material that is tightly quality controlled, resulting in a rug both durable and economical.